How long had the mother duck been sitting on her eggs? She could not remember. All the other ducks had hatched their eggs, and their ducklings were already bobbing in the water, making a shrill noise like this: Peep! Peep! Peep! There were seven eggs underneath the mother duck. Six of them were the same size, but the seventh was much, much bigger. It was uncomfortable for the mother duck to sit on the huge egg, but she didn’t complain. She only sighed and spread out her wings over her clutch of eggs, and wished that all those smooth, warm eggs would hurry up and hatch into ducklings. The swans began to move, and the Ugly Duckling who was really a swan moved with them. Out they went across the lake water, half-swimming, half-flying, clapping their wings as they picked up speed. The water rushed past their feet. Their wings beat strongly. Their feathers shone as the swans rose from the water, taking off into the blue spring air. Higher up they went, higher and higher until they could see the lake, the woods, the meadow beyond, and the cottage where the Ugly Duckling had spent the winter. 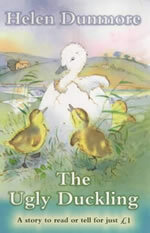 They saw roads and rivers, and far away they saw the farmyard where the hens scratched in the dirt and the mother duck waddled along with her ducklings. The farm worker looked up and saw the swans flying. He squinted because the sun was so bright. There was something about one of the swans which was familiar. Surely that swan reminded him of something, or someone? He shook his head. It was just his imagination. There they went, flying close together, like a family, their wings gleaming in the spring sunshine. The farm worker shaded his eyes and stared after them, until he could see nothing but seven specks of brightness.